The Eastern Bluebird, Learn All About The Eastern Bluebird. ■ Eastern Bluebirds eat mostly insects, wild fruit and berries. They have been seen capturing and eating larger prey items like shrews, salamanders, snakes, lizards and tree frogs. ■ Eastern Bluebirds typically have more than one successful brood per year. Early nests usually leave their parents in summer, but young from later nests frequently stay with their parents over the winter. 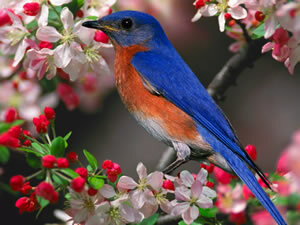 ■ The oldest recorded Eastern Bluebird was 10 years, 5 months old. ■ The Eastern Bluebird clutch size is 2-7 eggs. They have 1-3 broods. Incubation period is 11-19 days. Nesting period is 17-21 days. Egg description is pale blue or white.